What a pleasant week of October-like weather we have had here in southern Minnesota! High temperatures have remained in the 50’s to low 60’s (with the exception of today, which might reach the low 70’s), and we’ve seen nothing but sun all week. The winds however began to increase around mid-week, and after this brief warm front today rain showers are on the weekend’s horizon. Following a few days of precipitation, temperatures will get a bit cooler next week and we should see a few frosty mornings here in St. Peter. The scenery here in the Linnaeus Arboretum looks a bit conflicted this week. Many of our deciduous trees have dropped all their leaves, but many others still are holding on to most of theirs. What’s perhaps even more impressive is that some other trees aren’t even showing fall colors yet, but rather appear as green as they did a month ago. And it’s not just a difference between species; indeed, individuals of the same species are appearing in stark contrast to each other. This happens to some extent each fall, but the unusually warm weather we’ve experienced this month seems to have accentuated this difference. For example, in an “ordinary” October, all of our sugar maples will generally begin changing color around the same time, resulting in a “peak week” of maple color. This October, many of our sugar maples reached peak color a couple weeks ago and are now bare of foliage, yet many others have yet to show any signs of yellowing! Extrapolating this observation to other species, one can visualize the offset pattern of senescence (biological change) we’re seeing this fall. 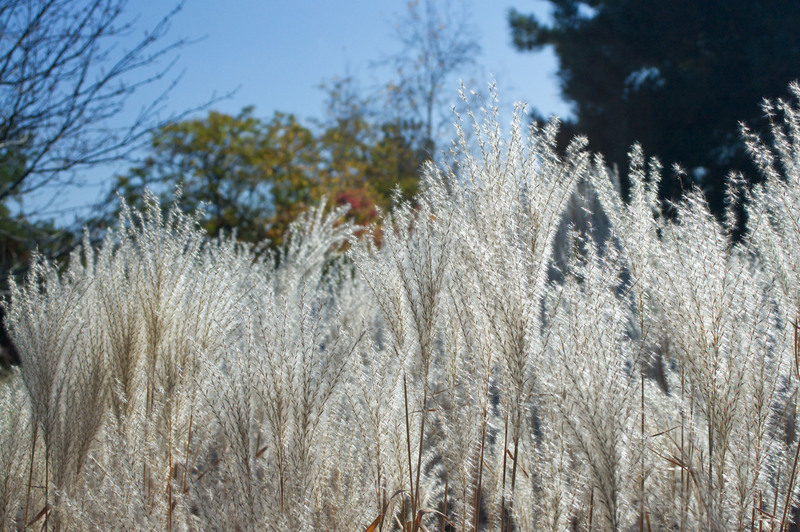 'Heavy Metal' Miscanthus in full bloom in Evelyn Young Gardens, 10/18/10.